The study investigated the failure to integrate faith in daily work--a multifaceted problem important for interdisciplinary studies in religion and society. The Purpose in Life (PIL) test and the Engagement in Meaningful Work Scale (EMWS) were used to research how religious faith impacted work perceptions of mortuary college students. Students from Gupton-Jones College of Funeral Service in Atlanta, Georgia and John A. Gupton College in Nashville, Tennessee were chosen as the respondents. 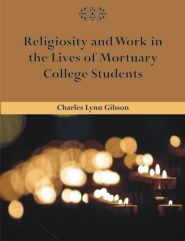 The following research question was examined: What were the effects of religiosity on mortuary college student perceptions of purpose in life and the engagement in meaningful work? The study identified four facets of religiosity for observation: (1) belief, (2) attitude, (3) practice, and (4) group experience. The primary research objectives examined the variables of denominational preference, Christian affirmation, favorability toward the institutional church, active church membership, the number of religious disciplines practiced, and involvement in church activities. Secondary objectives of the study examined the demographics of age, gender, educational attainment, and experience in funeral service work. Two hypotheses with ten corollaries for each hypothesis were tested-- eight with a Kruskal-Wallis procedure, ten with a Mann-Whitney U procedure, and two with a Spearman's Rank Correlation procedure. Six independent variables demonstrated a significant relationship with PIL values--funeral service experience, denominational preference, Christian affirmation, active church membership, the number of religious disciplines practiced, and the involvement in church activities. Six variables demonstrated a significant or practically significant relationship with EMWS values--funeral service experience, denominational preference, favorability toward the institutional church, active church membership, the number of religious disciplines practiced, and the involvement in church activities. Conclusions drawn from the findings of the study had important implications for the fields of religion, psychology, business administration, and funeral service.